All India IT Association (AIITA) is an autonomous organization registered with the Government of India - Ministry of Corporate Affairs (MCA), under Section 25. It is a platform for IT peoples and is imparting Computer Literacy & IT Education in minimum fee structure. AIITA has been established in 2007 to promote the cause of Information Technology development across the country, IT Corporate Sector among youth and professionals. It is one of the leading organizations that have been promoting cause of social, economic and professionals. We are spreading digital literacy and cyber security in rural and urban areas throughout the country. It is also engaged in Cyber Crimes Protection, awareness of cyber security and many more with its members. It has strength of more than 7,000 members to spread IT awareness. Since last 12 years the All India IT Association (AIITA) is extending computer literacy and computer education alongwith job-oriented courses for small entrepreneurs and small business, throughout the country in minimum fee structure. We are also regularly publishing newspaper AIITA News (E-Paper). It has various IT Education & Computer Literacy Centers throughout India in all the 28 states. 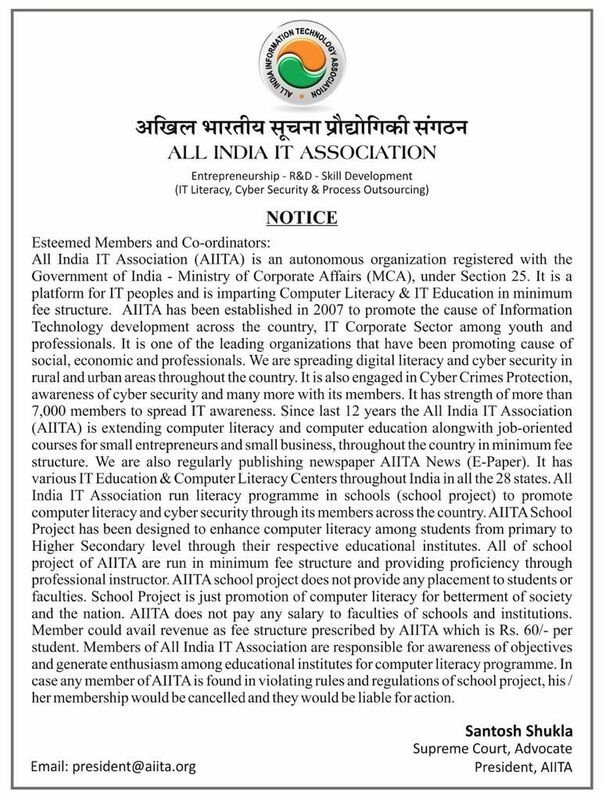 All India IT Association run literacy programme in schools (school project) to promote computer literacy and cyber security through its members across the country. AIITA School Project has been designed to enhance computer literacy among students from primary to Higher Secondary level through their respective educational institutes. All of school project of AIITA are run in minimum fee structure and providing proficiency through professional instructor. AIITA school project does not provide any placement to students or faculties. School Project is just promotion of computer literacy for betterment of society and the nation. AIITA does not pay any salary to faculties of schools and institutions. Member could avail revenue as fee structure prescribed by AIITA which is Rs. 60/- per student. Members of All India IT Association are responsible for awareness of objectives and generate enthusiasm among educational institutes for computer literacy programme. In case any member of AIITA is found in violating rules and regulations of school project, his/her membership would be cancelled and they would be liable for action.